Hey folks! 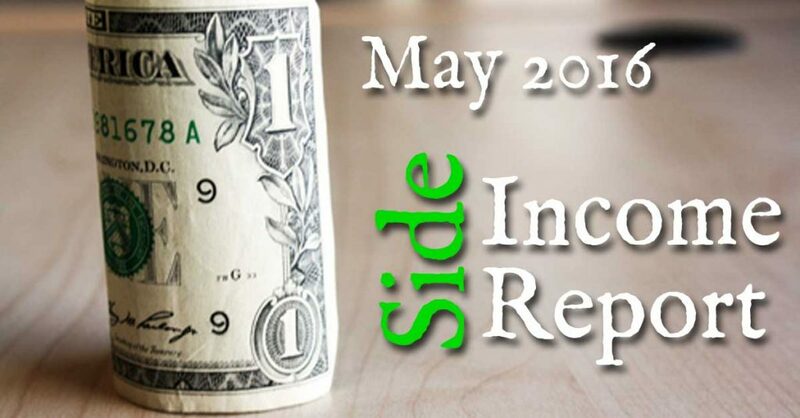 Time for another Side Income Report, where I openly share all of my earnings and expenses each month. May 2016 was better than April, but only by a little over $100.00. This is the result of slightly increased earnings, and some reduction in expenses. Earnings for April are pretty consistent with prior months of this year, which is good as my income is currently steady. However, I really want to see more significant increases each month, especially if I’m going to meet my goal of $5000.00 per month this year. I have some work to do, mainly around driving more traffic to my websites, especially the ones that aren’t earning much at all, and really should be! I’ll spend some time focusing on this in June. Had my Virtual Assistant publish new content to my niche sites – In all, he published 6 1000+ word articles. I worked the majority of the month on researching and planning for a new monetization strategy for my Blue Ridge Mountain Life site – More on that to come in the next month or two. I started two new Facebook Groups: 1) Income Bloggers Club – Which focuses on helping people earn money blogging and building out niche authority sites. 2) Blue Ridge Mountain Life Group, which is an extension to my popular Blue Ridge Mountain Life Facebook Page. I also spent a large amount of time promoting and advertising these new groups in various ways (future article about this coming soon). Current combined membership is over 500 – So it was time well spent, and I’m seeing increases in my website traffic and income as a result. I continued working on my autoresponder series for both my Blue Ridge Mountain Life email list, and my Side Income Blogging email list. This autoresponder series not only welcomes people to the mailing lists, but also sends out exclusive subscriber only content. My goal for the month was to get 10 emails in place for each list, I was able to write 8 for each. I’ll add a few more to each list this month. I consolidated the content on a few of my niche sites that just weren’t ranking well, into my other better ranking sites. I additionally deleted a few sites that were failing too. This happens, actually often. If I create 5 niche authority sites, generally only 1-2 will do well and are worth keeping. I don’t sweat it, cut bait, and move on. Nature of the business. Overall, great progress, just a somewhat shy of what I really wanted to get done, but I put family first, and during May, due to school wrapping up, my wife’s birthday, our Wedding Anniversary (24 years! ), and Mother’s Day I was a bit busy. Alright! Time for the numbers!!! Reminder: These numbers are across ALL of my sites, not just this one. Also, most links below are affiliate links – Remember, I only promote products I personally use! Uptime Robot: 5.50 (I added this for my clients, but use it now for my sites too. Monitors your sites, and pages you if there is a problem). So stay tuned, more articles and income reports to come! Also, if you aren’t subscribed to our mailing list, I would recommend you do. I am building out a series of exclusive email only articles to send out to my mailing list – Not to mention you’ll get my free eBook – BE a Better Blogger.